There's a scramble in front of Phantoms' net during the defeat by London Raiders. Photo: Tom Scott. Peterborough Phantoms’ perfect start to the NIHL Division One South season is over. 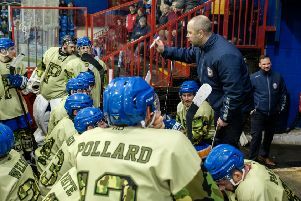 The table-topping city team saw their winning streak brought to an end last night (November 4) when beaten 6-3 by London Raiders at Planet Ice. Owen Griffiths (right) celebrates a Phantoms goal against London Raiders. Photo: Tom Scott. It was a first home defeat of the campaign and a first loss since the opening weekend of the season when Phantoms were beaten in an NIHL National Cup clash in Hull. “It is obviously disappointing,” said Phantoms coach Slava Koulikov. “We have been beaten in a game that everyone expected us to win – maybe even the team themselves. “If you look at the whole 60 minutes, there is no doubt we were the better team, but London were hungry, they were clinical and they had the luck. Robert Ferrara (centre) celebrates a Phantoms goal against London Raiders. Photo: Tom Scott. Barely a minute had passed when Phantoms found themselves behind as excellent Raiders import Juraj Huska punished a sloppy pass by racing through the zones to fire past netminder Adam Long. The deficit doubled as Brandon Ayliffe deflected in a powerplay blast from Huska with just under five minutes of the opening session to go and Phantoms were really up against when Marek Nahlik finished a quick breakaway before the mid-point of the contest. Phantoms finally had something to cheer when Owen Griffiths gobbled up a rebound seconds after a powerplay, but it wasn’t until the final period that they really looked like rescuing the situation. Two goals in less than three minutes eventually hauled them back onto level terms as Robbie Ferrara put away a Nathan Salem pass before Griffiths pounced on a powerplay. Tom Norton on the puck for Phantoms against London Raiders. Photo: Tom Scott. At that point, with a shade over nine-and-a-half minutes to go, there looked like being only one winner as Phantoms began to dominate. But they were undone by sloppiness in their own zone as the Raiders roared back into the ascendancy. JJ Pitchley restored the visitors’ advantage after being left unattended to strike from close range following fine work from Huska before the latter slammed a shot through the legs of Long. Phantoms pulled their netminder when making a desperate last roll of the dice, but there was no dramatic comeback. Instead further salt was applied to the wounds when Olegs Lascenko was awarded a penalty goal after Phantoms player-coach Tom Norton deliberately dislodged the net from it’s moorings to prevent the puck from rolling in. Koulikov added: “We got ourselves back level and it seemed like we had all the momentum, but the good work was undone by conceding a very childish and sloppy fourth goal. “We got caught puck-watching and left a guy completely free in the slot for a simple tap-in. That said the form of his netminder will no doubt be a concern for Koulikov. Long has not exactly seized his chance in the spotlight after offering glimpses of ability when backing up Janis Auzins for the past couple of seasons. And the contribution of the club’s two import players – Darius Pliskauskas and Ales Padelek – could also come under the microscope. Neither forward has come anywhere close to peak performance as yet this term. Phantoms remain top of the NIHL Division One South table due to a superior goal difference compared to Bracknell, who moved level on points with them last night. Phantoms will attempt to make an immediate return to winning ways tonight (November 5), when they travel to Swindon (6.15pm).